Are you traveling this holiday or will you be sharing a lovely Easter meal at home with family or friends? What do you serve at Easter? In our family, a traditional Easter dinner or brunch wouldn't be the same without some sort of a succulent glazed ham, and being that Easter is almost here, I thought you would enjoy our family's favorite glazed ham recipe, Cherry Glazed Ham. Let's face it, ham is the perfect entree for most holidays and occasions, as it easily pleases a crowd. And what ham wouldn't be complete without a homemade glaze, not the little packets that come with the hams, a real homemade glaze. It only takes a few minutes to prepare a glaze and the possibilities are endless. Over the years I have experimented with our various preserves and hot pepper jams in this basic recipe, and all the results have been just as fabulous. This time, I was craving a glaze bursting with cherries and this easy to make sweet-salty ham recipe, featuring our Cherchies® Cherry Butter Spread, Cherchies® Champagne Mustard, and just the slightest hint of Bourbon, is the perfect addition to your holiday menu. So gather up your guests, grab a jar of Cherchies® Cherry Butter Spread, Cherchies® Champagne Mustard, slather on the glaze, and serve this delicious ham with your favorite side dishes for an exceptional holiday meal, and wait for the ooohs and ahhhs! 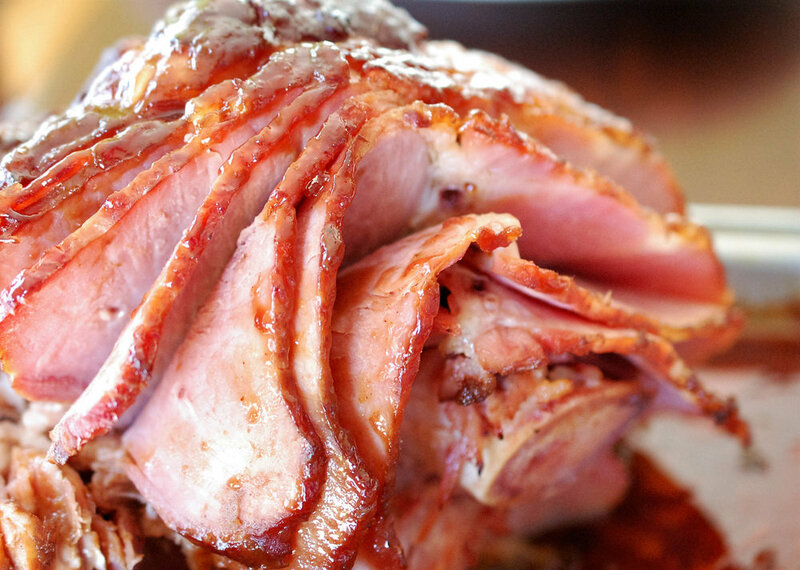 This will definitely be one of your favorite ham recipes. * Note- Substitute Cherchies® Cranberry Preserves with Champagne for the butter spread for a festive flair! Prepare the glaze by combining Cherchies® Champagne Mustard, Cherchies® Cherry Butter, brown sugar and Bourbon in a small sauce pan. Cook on low until smooth. Pour half of the glaze over the ham and cook the ham according to the package directions, normally 15 minutes per pound until warm. Chill the other half of the glaze until later. When the ham is about a half hour from being done, remove the ham from the oven and pour the rest of the glaze over the ham. Cook the ham for the remaining time. When the ham is warmed, cool for 15 minutes before serving.